Dr. Lydia Villa-Komaroff is best known for cloning an insulin precursor in bacterial cells; her work made the hormone much more readily available for the treatment of diabetes and paved the way for similar applications of DNA recombination that were used in the emergence of the biotechnology industry. 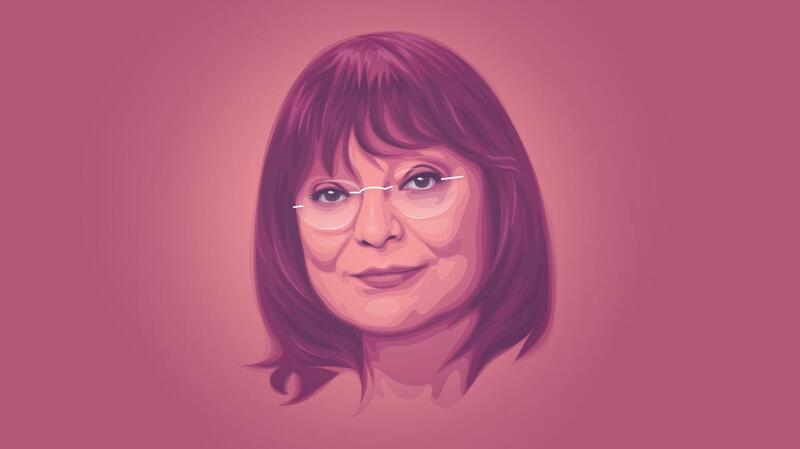 After a successful tenure as a principal investigator, she served as the vice president for research at Northwestern University and later the Whitehead Institute and has founded, served as a senior executive for, and sat on the board of several biotechnology companies. In her retirement, she now applies herself to advancing women and minorities in the sciences. She was also an honorary co-chair of the March for Science in 2017. She is a co-founding member of The Society for the Advancement of Chicanos/Hispanics and Native Americans in Science (SACNAS) and was one of the first Mexican-American women in the United States to receive a doctorate in the sciences. Dr. Villa-Komaroff has also been an honorary member of GWIS since 2001. The Science Club for Girls honored Dr. Villa-Komaroff with their Catalyst Award. 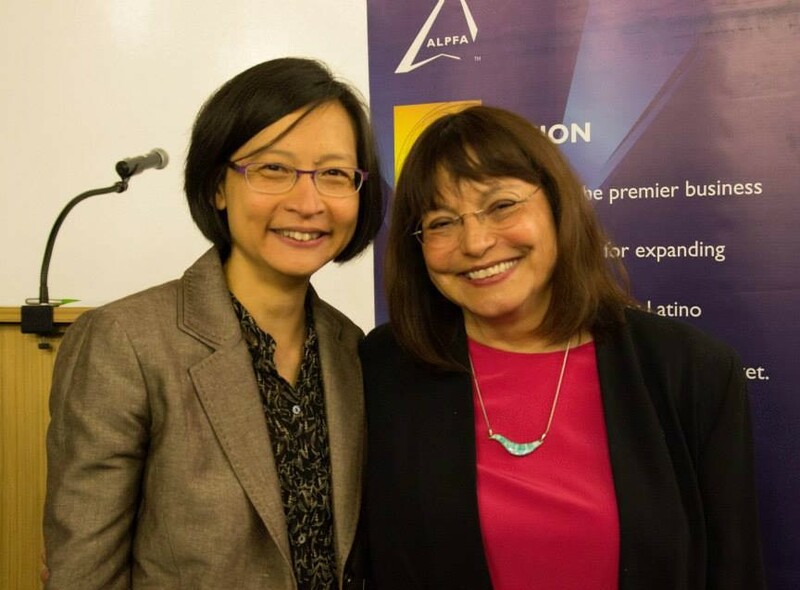 She is shown here with their executive director, Connie Chow, who wrote a glowing description of her in a blog post: "She is a tremendous role model and is at the forefront of ensuring diversity in the sciences, locally and nationally." What was the trajectory of your career? I come from a very large Mexican-American family and went to graduate school at MIT where I worked with David Baltimore and Harvey Lodish. Both Harvey and David were terrific mentors. One of the themes of my career is the excellent fortune I’ve had in the folks that I’ve been able to work with. After graduate school, I did a postdoc with Fotis Kafatos at Harvard. We wanted to do modern molecular biology in the silkworm model Antheraea polyphemus, but it turned out to be a very complicated organism for these techniques because its genome is as big as the human genome. So those experiments to try to clone RNAs in the silkworm never really worked out at all. After a year of things not working, I went to work with Wally Gilbert. The project was to clone proinsulin to show the possibility of producing insulin using recombinant DNA. We were successful, and now almost anybody in the world who takes insulin for their diabetes is taking insulin that was made using the methods we and others developed in the 70s. It was the beginning of the production of useful proteins for medical purposes. Then I set up my laboratory at the University of Massachusetts Medical School where I ran a lab for eight years. I got tenure, but that was not a slam dunk, so I left UMass and went back to a non-tenured position at Harvard and set up a lab at Children’s Hospital. I spent eight wonderful years there doing good science with good people. I loved being a bench scientist. There is nothing more thrilling than finding something that you know no one else has found. But I think there comes a time in everyone’s career, probably several times, where you sort of stop and say, “Am I where I want to be? Am I doing what I want to be doing? Could I be doing something different that would give me satisfaction that uses the skills that I’ve developed over time?” As a result of that introspection, I went to Northwestern University into an administrative position. Two years later, I became the vice president for research at Northwestern, which was a terrific position. I really loved it. I did that for a total of seven years, but my husband and I were commuting during that time. So I came back to Boston and took a position at the Whitehead Institute as their vice president for research and chief operating officer. I did that for three years. The person I’d come to work with, Susan Lindquist, who was an absolutely brilliant scientist, decided at the time to go back to devoting all of her time to the laboratory. So I looked around and joined a company that had been started by John Gilbert. I took over that company after about a year and ended up working in an executive position for a biotech company for ten years. In 2014, I left that position although I remain a member of the board, and now I work for myself. I devote most of my time to the issue of women and minorities in science and why there aren’t more of us. In my semi-retirement, I’m trying to make the case to my colleagues in the hard sciences that we need to take findings in the social science very seriously if we want to make any progress in bringing more diversity into STEM. What are the most important steps you took to get where you are now? The first is that it really helps if you are prepared when you go to college and you have learned the discipline of study. I didn’t really learn that until I got to college. I think if I had the grades in college now that I had back then, I would have a really hard time getting into graduate school today. Fortunately it is still true that if you do best in your second and third year, then schools will be somewhat more forgiving if early grades are not so great. But that is the hard way to do things. The other thing I think that has been very important for me is an ability to not be too discouraged by failure. I had to take organic chemistry twice. The first time, I flat out failed it, and the second time I aced it. Persistence, the ability to get up and find the appropriate help and just do it again and again, is really important, particularly if you are a bench scientist where things not working out the way you expect is an everyday occurrence. The other thing is the willingness to take a chance. I’ve changed directions in my career several times and each time it has been very rewarding. For example, when I left the bench to become an administrator, a lot of my colleagues felt that I had sold out, so to speak. I’d gone to the dark side to be an administrator. On the other hand, I was one of the last in my group of colleagues at graduate school to get involved in a company. I have been willing to take jobs that were a stretch and to go a little bit beyond my comfort zone, which I think is important too. Is being a scientist what you always wanted to do? Being a scientist was always what I really wanted to do, and I decided that very early. When I was really young it captured my attention, and I never lost that. What’s interesting is that when I became an administrator, there was about a year when I’d wake up at about 4 o’clock in the morning and worry (which everyone does), and I wondered if I was still a scientist. What should I write down when forms ask for my occupation? I wasn’t comfortable with the idea that I was now identified as an administrator. I felt that I was a scientist doing a job with and for other scientists that also required some administrative acumen. It took about a year for me to realize, “Oh, I guess it doesn’t matter what I do. I am a scientist to my core, and I take those skills with me and use them in all of the different settings that I’ve been in.” It doesn’t matter if I’m at the bench or I’m sitting down in a board room at a board meeting. Some of the things that I’ve learned as a scientist are really applicable, and my general approach is that of a scientist. So I pretty much concluded, that’s what I am; I’m a scientist. I don’t have to stay at the bench to remain a scientist. Watch this video to learn about Dr. Villa-Komaroff's contribution to the biotechnology industry and why she believes it's important to take chances. What advice do you have for an aspiring scientist, particularly women in science? I think that the critical thing to realize is that science is a way of doing things. If you really love science, you should do it and then figure out how you use it. Students these days worry because academic positions are pretty hard to come by. There are a lot of different ways to use the knowledge you’ve gained from doing science. I think that it’s really important for people to understand that scientists aren’t unemployed. Scientists have one of the lowest unemployment rates. We’re well trained to fit into a variety of different kinds of positions. Each individual has to figure out how they want to use this approach, this being a scientist, in their careers and in life. And there are almost as many answers as there are people who have to answer that question. I think the main thing is not to be blinded by what it is immediately in front of you. Even if you love science, you have to ask yourself, "if I couldn’t do this, what would I do instead, and how would that be better?" That’s the question you always have to ask yourself at any point when you’re looking at a path in life: Is this the best path for me now? You also have to understand that no path is irreversible. 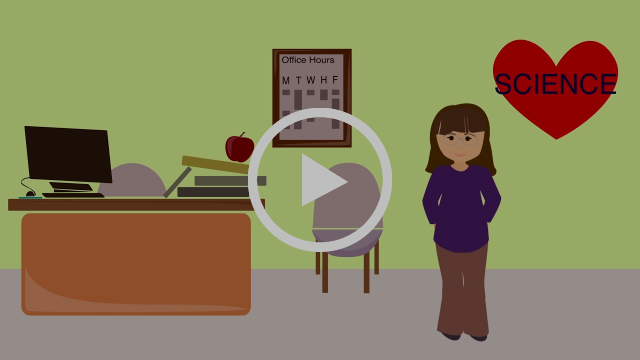 So as a graduate student, your job right now is to do that work. Do the coursework, do the lab work, and learn what you can from that experience. You might decide you don’t want a full PhD, and that a master’s is fine. Or when you finish the PhD, you might not want to do a postdoc but apply your scientific approach to something else; and that can vary from writing, to law, to creative arts -- name it and you can use your training there. So the main thing is don’t worry so much. I think that people end up most unhappy when they avoid the thing that they most want to do because they’re afraid. And it’s OK to be afraid (we all are at one point or another) but I think that in the end, I would have been a lot less satisfied in my life if I had not taken chances. I think the biggest challenge is the idea of expectations. We as faculty members haven’t realized the challenges students face in science as fully as we could and haven’t implemented in the curriculum the appropriate training of students so they’re ready for a wide variety of options in their career. Many universities now do have programs where they bring in people who are doing different things so students can get an idea of the kinds of things that can be done with an advanced degree in science and technology. I think we could do a better job. 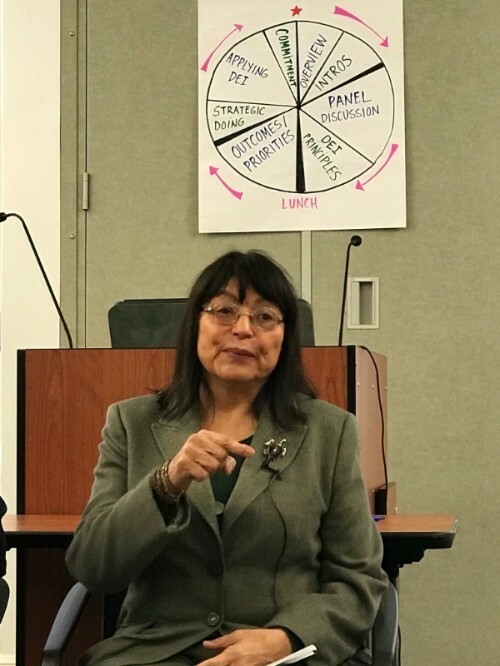 Dr. Lydia Villa-Komaroff speaking on a panel during a NOAA SeaGrant Diversity, Equity, and Inclusion Visioning Meeting at the College of Charleston in South Carolina. Photo by Austin Shelton, PhD via Twitter. What are the challenges for upcoming Hispanic women scientists? What are the skills they might need to overcome adversity (limited funding and/or tenure positions, etc.)? I think that for all women, but maybe particularly for Hispanic women, the main thing is this business of confidence. It is so easy for us to get in our own way. There is still the perception out there that women are not as good as men at certain things. This is a perception; this is not truth, but it can do a job on us. A social scientist named Claude Steele showed almost 30 years ago that the reason this happens is because women doubt themselves. For example, women know that most people think women are not as good at math as men. Especially if you are an ambitious, talented young woman, when you take a math test, you want to do well. But you’re afraid you won’t do well, thereby disappointing yourself and other people. So you sort of obsess about it, and that takes mental energy. If you use mental energy worrying about doing well, you are not using that mental energy to focus on the job of doing the test. So you don’t have at your fingertips the knowledge that is back in your brain. This is called stereotype threat. It doesn’t have to be math, it can be athletics or any other field. You can show this through fMRI scans and see people’s brains lighting up with this worry and using up energy that really should be going towards the task at hand. If we can figure out ways women can tell themselves or have their peers tell them “OK, we know that our society thinks that we’re not as good at this, but we know that that’s not true. We have all these role models, we have all these studies that say women are equally good at it, so I mustn't let myself worry about it. I have to focus on the exam.” You can make it a kind of mantra. If you can break stereotype threat, then you will do better. 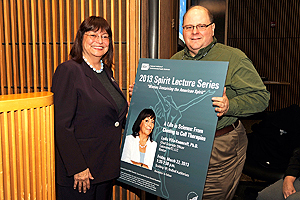 Diversity Council chair Brad Collins, right, presented Dr. Villa-Komaroff with a copy of the poster advertising her talk at the 2013 Spirit Lecture Series at the NIH. The idea of mental energy seems to seep into a lot of things. Even from a young age, like in middle school, girls are conditioned to worry so much about extraneous things like how they look and what they wear -- those things take up a lot of mental energy. That’s exactly right. I think the biggest challenge for us as people (never mind men, women, or minority) is that we have brains that are limited in capacity and have evolved to deal with processing a massive amount of information every second. So we’ve developed ways of dealing with that processing limitation, and those ways don’t always do us favors, and we have this business of automatically assuming we’re not as good at it, or assuming things about people in our society because of how they look rather than what they actually do. Overcoming that, I think, is the biggest challenge that we have in front of us. You mentioned in our email correspondence that you think the way the brain has evolved presents a barrier for change -- how did thinking about representation in the sciences lead you to question the condition of the human mind? Well it started with just the observation. You know, I’ve been around for a long time, and for 50 years I’ve been interested in getting more women and minorities in science. While we sort of see an upward slope in those numbers, it has not increased as rapidly as one might expect given the population. So you have to ask why. As I got older and started focusing on this more, some things occurred to me. One was that, as a basic scientist, I have been guilty of not knowing enough about behavioral sciences. There are findings that speak to how we make decisions, and how the mind can be limited in its perceptions of others, by virtue of the social context that one grows up in and is influenced by. I started reading about this stuff and realized that a big part of the problem is that people mean well. Most people in most academic settings and corporations really do want more diversity. They want to do the right thing. They recognize the advantages of diversity, that if you have a team of people who have had different experiences in life and bring different understandings of the world, you will get a richer approach to a problem. There’s still a lot of overt prejudice which is particularly evident right now. Nevertheless a lot of people in a lot of places really want to do the right thing. The problem is that our brains have to make decisions rapidly, and we develop mechanisms that do it in an automatic fashion. So it becomes more reflexive than contemplative. And when we act automatically, we are making decisions that are based on the culture that we’ve grown up in. One of the healthy things about what’s going on now is that you kind of can’t avoid it. There is an explicit discussion of the issue of race and gender. We’re seeing things like #MeToo, and people are beginning to use the thinking part of their brain in dealing with these issues. We know from studies that if we can get people to stop reacting reflexively when they look at a CV or another person, we get better results. And this is not something that’s limited to the white population. It’s everybody in the country. It has been shown experimentally that in some cases minorities are prejudiced against minorities. If a minority faculty member is evaluating the CV of a minority applicant and a white applicant, on average that faculty member is going to say that the white applicant is more qualified, even if the CVs are identical. So it’s not a white person problem, it’s a human thing. The ability to react reflexively, and in doing so generalizing and making assumptions instead of objectively processing all the information at hand, is a trait that we all share. It has allowed humanity to survive, and has helped us to get to where we are. Fortunately, we’re good at compensating for our evolutionary deficiencies. We don’t have fur, so we learned how to make clothes and fire. We can deal with this, but we have to know what it is and we have to want to deal with it. I think we’re on the cusp of that which is why most of the time I’m fairly optimistic about it. I’m also optimistic. It’s important what you said, that people need to learn to stop reacting reflexively. Especially in this political climate, everywhere you look there’s a lot of conflict, a lot of friction. You can feel a lot of people are acting reflexively and defensively to change and ideas. People get offended and it can sort of snowball into this large problem where people aren’t communicating properly. What do you think is the best way to talk about these issues and to approach people that have a different perspective on these issues around gender and race? We are at a time when, encouraged by some of the folks at the top, there’s a sense among a segment of the population that truly does believe that certain things are true. That they’re better than anyone else because of their gender or race. But we also know that there are a lot of people who, in their own mind, truly aren’t biased against anybody, although their behavior may not be a reflection of that. We all have this tendency to be more comfortable with people that are more like us and to want those people for our colleagues and our students. It’s encouraging to me that at least in academia and in other areas, that people are willing to say, “Oh, I know that I do this. When I have an opportunity to evaluate people I’m going to think twice and I’m going to ask myself, ‘What if this CV was from John instead of Jane. What if this was from Jane instead of Janella, what would I think?’”. People are trying to think more objectively and recognize our implicit subjectivity and to not be in a hurry. Over time people do make better decisions, and we do get more diverse hires and so forth. It’s easier at the student level because, as you go up the ladder, it gets harder; that’ll take some time, but I think it’s happening. The good thing about what’s happening now, is that these issues are so flagrant. That forces the rest of us to discuss these issues in a reasonable way. So among ourselves, with people that we trust, it is a topic of conversation. People are learning more about what happened in the country when Jim Crow was in effect and how many more people are stopped because of the color of their skin and no other reason. It’s just a matter of numbers. If you look at who is stopped, it is people of color. If you look at who has got the drugs the cops are supposedly looking for, it’s not that simple. We’re talking about it more. Uncomfortable as it is, I think overall that’s probably a healthy thing. We can try to set up situations where it’s safe to talk about these issues, and people will make an effort not to be offended or offensive. You can try to have that conversation as reasonably as you can while remembering to take a break when it gets a little too hot. It’s not easy, but it’s really worthwhile. 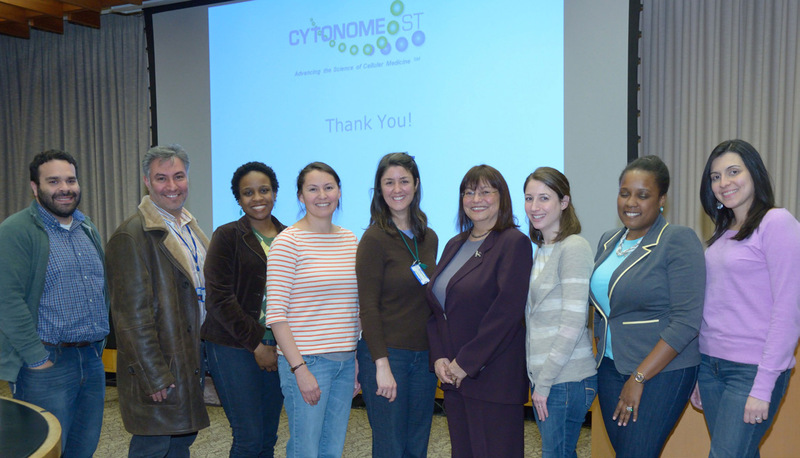 Dr. Villa-Komaroff (fourth from the right) is joined by SACNAS members after her talk, “From Cloning to Cell Therapy: A Life in Science” at the NIH. SACNAS members are (from the left) David Soto Pantoja, Leonardo Mariño-Ramirez, Erika L. Barr, Tamara James, Pamela Tamez, Rocio Benabentos, Shauna Clark and Natasha Lugo-Escobar. As graduate student, you co-founded The Society for the Advancement of Chicanos/Hispanics and Native Americans in Science (SACNAS). In balancing your time through your different interests, such as science, politics and activism, what have you learned about how to distribute your time? I think, first of all, it’s not a matter of balance; it’s a matter of juggling. You find the things you think are important -- for example, I read constantly. So I have books here and there, everywhere, and I like fiction. Now I’m reading more autobiographies and non-fiction, but for a long time that was the way I would rest my brain. Great scientists say this all the time, their biggest breakthroughs come when they are not thinking about the problem at hand. You think hard about it, but then you have to let it go, you have to chew on it in order to access that part of the brain that you don’t necessarily have conscious access to. The best way to do that is through something like hiking, reading music, watching The Crown, following the tweets -- for everybody it’s slightly different. As humans, it’s very hard to focus on one thing constantly. You can wear yourself out. Burnout is a real thing. The way you avoid it is to cut yourself a break. There’s nothing that will work well if you are not in reasonable shape, and to do what you have to do to take care of yourself. I found that in my own life sometimes it can be difficult to tell the difference between taking care of yourself and being self-indulgent. I think that, as women, we in particular tend to worry that maybe we’re being self-indulgent when actually what we’re doing is taking care of ourselves. What we have to do is just tell ourselves, “I just have to not. I just have to stay home and eat ice cream tonight. I can’t try another experiment at this moment or I’m going to blow up.” In general you have to recognize that you have to put in time for you. And that time can be used for giving back, that could be a source of strength. You have to decide in your own life when things are a drain and when things are energy-giving. And you follow the things that give you energy. Interview conducted over the phone and condensed by Olivia Goldman. Title image by Electra Sinclair and obtained from Motherboard. Video by Maria Adonay, Katie Rondem, and Rita Algorri. Copy edited by Rozzy Finn.